Devin Smith is an American football player who plays for the Dallas Cowboys of the National Football League (NFL). He plays as the wide receiver. Previously, he was drafted by the New York Jets in the second round of the 2015 NFL Draft. He played high school football at Massillon Washington High school and played his college football at Ohio State. 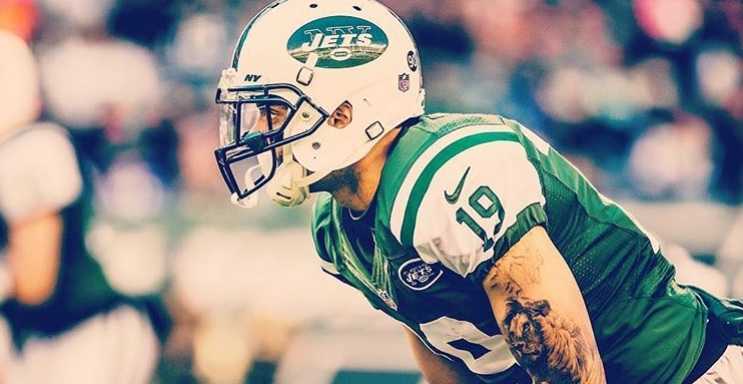 Former New York Jets wide receiver gets a second chance with the Dallas Cowboys. Devin Smith, 26, a wide receiver from Ohio has received a second chance, as the Dallas Cowboys signed a future deal with him on 18 January 2019. The New York Jets signed him in the second round with the 37th overall pick of the 2015 NFL Draft. However, he missed most of his rookie season due to a torn ACL injury and missed the entire 2017 season. He only played four games during the 2016 season. As a result, the Jets waived him in July 2018. Devin did not get much exposure in the NFL career as he stayed out the field due to two severe injuries. The Dallas Cowboys has stepped forward to give Devin a new chance by signing him a future deal. With this, the 26-year old still had a chance to shine. He became the second-best in school history with 110 career catches for 2,119 yards and 24 touchdowns. Devin Smith was born on 3 March 1992. He was born to a father, Andre Simpson and a mother, Atina Smith. Information regarding his siblings is currently unavailable. His birthplace is in Akron, Ohio in the United States. He holds American nationality. His zodiac sign in Pisces. He attended Massillon Washington High School. After graduating from high school, he enrolled at Ohio State University to play college football. Devin Smith started playing football along with basketball and tracks at Massillon Washington high school. At the high school, he was a two-time first-team All-Ohio performer. He had a 110 career catches for 2,119 yards and 24 touchdowns, becoming the second-best in the school history. At the high school, he was named All-county Independent Player of the Year. Rivals.com considered him a three-star recruit, rating him as the 58th best wide receiver prospect of his class. He enrolled at The Ohio State University to play college football. He earned all-conference honors as a junior at Ohio State. He had 2 receptions for 87 yards, including a 47-yard touchdown, where Ohio State defeated Alabama in the 2015 Sugar Bowl. He had one reception for 45 yards in the victory over Oregon in the 2015 College Football Playoff National Championship. He finished his college career with 121 receptions for 2,530 yards and 30 touchdowns. He was drafted by The New York Jets in the second round with 37th overall pick of the 2015 NFL Draft and signed a four-year deal for $5.87 million with $3.23 million guaranteed and a signing bonus of $2.53 million. He caught his first career touchdown against the Miami Dolphins in November 2015. He suffered a serious knee injury, a torn ACL on 12 December 2015 that ended his rest of the rookie season. He started the 2016 season on PUP to rehabilitate his right knee injury and played only four games during the season. He suffered another torn ACL to the same knee in April 2017 resulting him to miss the entire 2017 season. The Jets waived him in July 2018. The Dallas Cowboys signed a reserve/future contract with him on 18 January 2019. Devin Smith is a married man. The identity of his wife is currently unavailable. The couple has two children, a son, and a daughter. The wide receiver Devin Smith stands at a height of 1.85 m i.e. 6 feet and 1 inch tall. He has an athletic body build. He has a body weight of 196 lbs i.e. 89 kg. Other information regarding his body measurements are currently unavailable. The estimated net worth of Devin Smith as of 2018 is currently unavailable. However, it can be assumed he hasn't earned a huge fortune playing in the NFL as he suffered injury and remained out of 2015 and 2016 season and entire 2017 season as well. He played football, basketball and ran tracks at the high school. He was the state's long jump champion. He finished first and recorded a personal-best time of 10.56 seconds in the 100-meter dash as a sprinter at the 2011 state meet. He was also a state qualifier in high jump. He also spent three seasons sprinting and jumping with the Buckeyes track and field team. He was qualified for NCAA regional competition.